Due to Manufacturing increases, all prices will increase 5% after March 31, 2018. Our prices have changed little in the last 5 years - we hope to keep it that way in the future for as long as possible! Please see the ORDER Page for specific information. News FLASH! And, like an encore, we've done it one MORE time! ..And think about it: If we drop a price category 3%, your profit just went up 6%! Also, we've slashed our shipping...AGAIN! Depending on quantity ordered and payment term options chosen, the savings is even better than before and SIMPLE ORDERING is the order of the day! Get all the details on the Order CrackZapIt page. 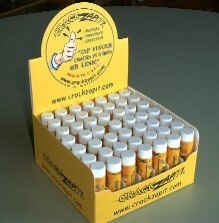 By popular demand, we completed our POP (Point-of-Purchase) Check-Out counter-top displays for CrackZapIt! They hold 49 tubes so each 100 tube 'REFILL' pack you order will fill the display twice. As you can see, they are 'EYEBALL MAGNETS'! All customers are welcome to 'snag' these graphics for use in your paper and online promotions, too. I'll be happy to send you larger and finer versions you can resize yourselves - just email me, crackzapit@gmail.com. 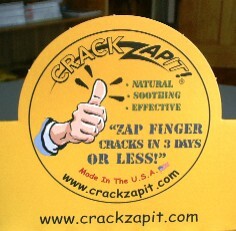 You are also welcome to use any of the graphics on this site that contain images of CrackZapIt! for your advertising and promotional purposes as well. To go to the Distributors Info page, just click on the above photo of the display! BUT...if asked for a PASSWORD to access links on that page..
... call me at 970 327 4013, leave a message if necessary and I'll get back to you! here. Thank you all! I look forward to you enjoying, using, and profiting by the new POP display box.